A well-known racing advisor to racehorse owner Sheikh Mohammed is to set up his own training business. 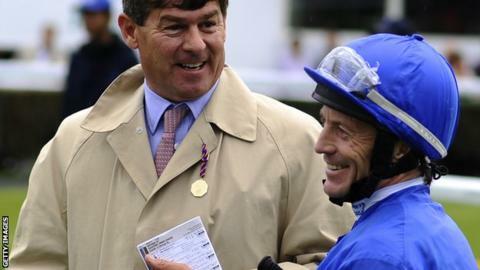 Simon Crisford has been with the Sheikh's Godolphin team since its inception in 1994. He was moved from the role of racing manager to become an advisor as part of a shake-up of the organisation following a doping scandal involving trainer Mahmood Al Zarooni. "I am very excited to be setting up my own training business," said Crisford. Crisford, a former Racing Post journalist, is a familiar face to followers of British racing having first teamed up with Sheikh Mohammed in 1989. He played a key role in expanding Godolphin into one of the most successful teams in horse racing. Crisford was the organisation's spokesman at the time of the Al Zarooni affair, and sat alongside British Horseracing Authority officials at a press briefing following the trainer's ban. An inquiry found Al Zarooni acted without the knowledge of Godolphin's leading figures. The 52-year-old, who plans to continue his consultancy work as racing advisor to the sheikh's Maktoum family, added: "My immediate plans are to start structuring my new business and recruit some talented staff. "I will be working hard to build a team of horses and to put everything in place so that we are up and running in time for next season." Crisford's training business, intended for Carlburg Stables in Newmarket where veteran trainer Clive Brittain is providing space, is subject to approval from the British Horseracing Authority. BHA spokesman Spokesman Robin Mounsey said: "We have yet to receive an application for a licence to train from Simon Crisford. "Should we receive one it will be considered in the normal manner, in light of the standard criteria set out in the application guidance notes. These criteria include the completion of all relevant modules of the training programme."